If you’re tired of living with gapped, crowded, or otherwise misaligned teeth, we’ve got an idea for your New Year’s resolution. Have you considered Invisalign, clear braces for adults and teens? It’s the premiere treatment option for anyone who’s reluctant to wear bulky metal hardware for two or more years — which, as it turns out, is most people. Dr. Gray and Dr. Newman are pleased to offer Invisalign in 77077! 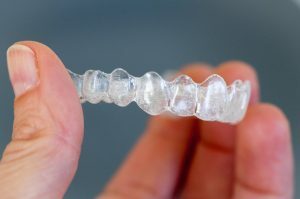 Invisalign is an FDA-approved orthodontic solution that has helped millions of people worldwide achieve straight teeth and a properly-aligned bite. It works using a series of customized trays, each one placing focused pressure on different teeth throughout treatment. While the length of treatment depends on your unique case, teeth are gradually repositioned into the proper alignment over a period of one year, on average. What’s it like to wear Invisalign? Probably easier than you would imagine. You can take them out before eating and cleaning, so you don’t have to worry about modifying your diet or learning any new brushing and flossing techniques. Simply wear your Invisalign aligners for the recommended 20 to 22 hours each day, removing them before meals, snacks, and to brush and floss regularly. You will use each tray for two weeks before advancing to the next in the series, and visit Dr. Gray’s office for your regularly-scheduled visit every six weeks. Straight teeth that fit together like they should improve your oral and overall health. For adults and older teens who are reluctant to wear metal braces, the advantages of Invisalign are clear. Which benefit would you appreciate most? Removable trays make brushing and flossing as easy as before you had braces. You can continue to all eat your favorite foods with Invisalign. Smooth plastic won’t rub a blister or sore spot in your soft oral tissues. Enjoy speaking and smiling with confidence with discreet clear braces. Spend less time in the dental chair thanks to the self-directed treatment. Total treatment time is often reduced with Invisalign. Many patients who are interested in straightening their teeth with Invisalign are pleased to learn they are eligible for the treatment. The system corrects mild to moderate misalignments, including crowded teeth, gaps between teeth, and overbite, underbite, and crossbite. Seriously misaligned teeth may still require treatment with traditional braces. Dr. Gray or Dr. Newman can help you understand which method is best for you, and why. The team at Mark Gray DDS wants to help you achieve straighter teeth and a more beautiful, confident smile. Discuss Invisalign with your dentist in 77077 in the new year! Request an appointment at our office today.